breached aaand secure from the wind. inverted towers opening to an infinite underworld. The most typical and idiosyncratic objects of beach holidays in our western windy islands – the coloured and stripped windbreaker – were employed to create the Lynders Mobile Home Park Maze. 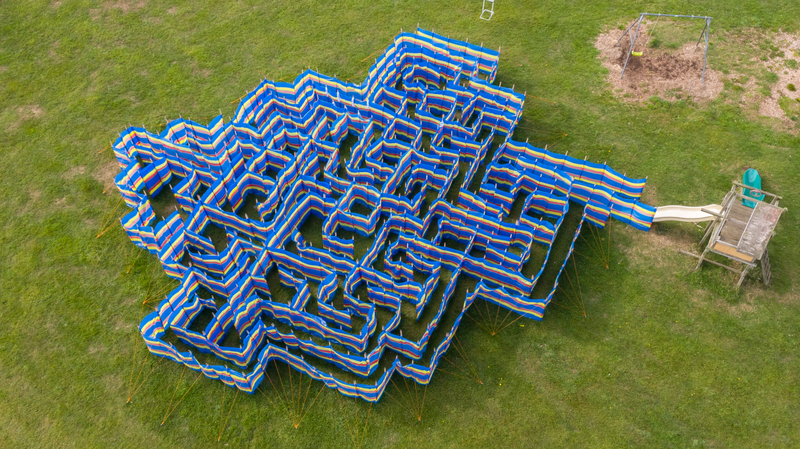 Hidden within the maze are a series of chambers with sculptural inversions waiting to be discovered. ​Gillian Lawler’s Inversion I, II and III infuses the idea of place, organisation, relocation and transformation through different states of being. Submerged into the earth, Inversion I, II, and III reveal an opening between two worlds, a plantation of infinite voids, leading somewhere else. Recurring checker board motifs accentuate a definite but skewed anti-perspective, which herein add to a surreal, dreamlike sense of discomfort, where what appears to have been planned according to a perspectival logic is withheld and subverted. This entry was posted in Uncategorized on September 14, 2018 by markcullen12013.